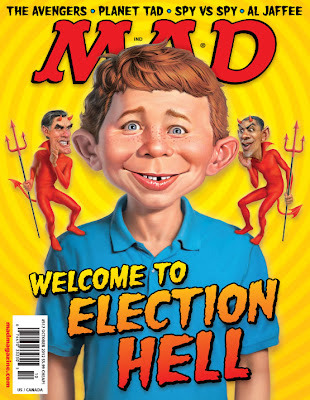 I have a cartoon in MAD Magazine #517. You can see it if you buy the magazine. It was a real pleasure and surprise when, this past spring, I got the "OK" for my cartoon. Getting into MAD has been on my list of things I want to accomplish. So ... this is my first time in MAD. It won't be my last. All I can say is WOW. Do I have to fold it together to see it, Mike? Wow! If only the Dutch would still exist! I am at the Mad office tomorrow and I'll make a big thing about your cartoon! "You got Mike Lynhc!?" He is, like so good! Did you know he did music books? I folow his blog all the time! He has such a great following!" Mail me your telephone number and I'll call from the train tomorrow morning! That's something to be proud of and excited about! Congratulations! I have a subscription and look forward to seeing the cartoon!